The Americas, including the Caribbean, got the chance Wednesday night to view last total lunar eclipse until 2010. There were cameo appearances by Saturn and the bright star Regulus on either side of the veiled full moon. The Associated Press reported that skywatchers viewing through a telescope had the added treat of seeing Saturn’s handsome rings. Weather permitting, the total eclipse could be seen from North and South America. People in Europe and Africa were able to see it high in the sky before dawn on Thursday. As the moonlight dimmed — it won’t go totally dark — Saturn and Regulus popped out to sandwich the moon. Regulus is the brightest star in the constellation Leo. 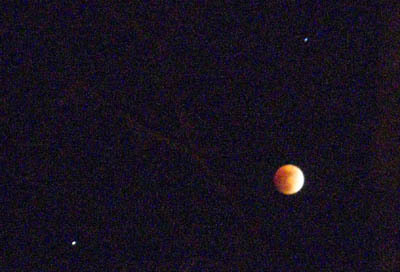 Wednesday’s event will be the last total lunar eclipse until December 20, 2010. Last year there were two, AP reported. Editor, author and writer with career spanning print, radio, television and new media. What's The Matter With The World?